His biggest opera hits. 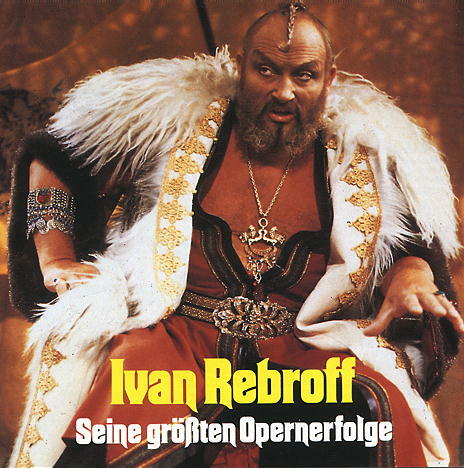 If you thought Ivan only sang easy listening tunes, you'd be wrong. Oh sancta Justitia (Lortzing). The first part is happy and confident, the second wistful, with anger and reconciliation also making an appearence, and some very fast lyrics at the end. Als büblein klein (Nicolai). A bombastic piece. Funftausend taler (Lortzing). A plot eposition piece. La Calunnia (Rossini). Classically operatic. Auch ich war ein Jüngling (Lortzing). A slow and rich piece. , Salam aleikum (Cornelius). Moderate pace. O Isis und Osiris (Mozart). Slow majestic song. Oh! Ich erstick! Der atem geht mir aus (Mussorgski). He takes a long time to die! Theatrical. Ella giammai m'amo (Sie hat mich nie geliebt) (Verdi) A slow sad piece. Infelice... e tou credevi (Unglückselige, und du Glaubtest) (Verdi) Gently rolling tune. This compact disk is © 1984 Elisar Records, Offenburg, Germany. Code CD 31739-3. Barcode 4-011660-017396. Information reproduced for review purposes.